Ninja Theory is a developer that doesn't have very much work under their belt, but the work that they have done has type-cast them into a very specific niche of games. They got their start with the PS3-exclusive Heavenly Sword, and then went on to develop the rebooted DMC (Devil May Cry). So they specialize in stylish, fast-paced, thumb-blistering action games. Hellblade: Senua's Sacrifice is a bit different though. It still has plenty of hacking and slashing, but it's a much slower, more cerebral experience, and it's Ninja Theory's first game that seems to really be about something. One of the principle gimmicks of the game is its perma-death feature. 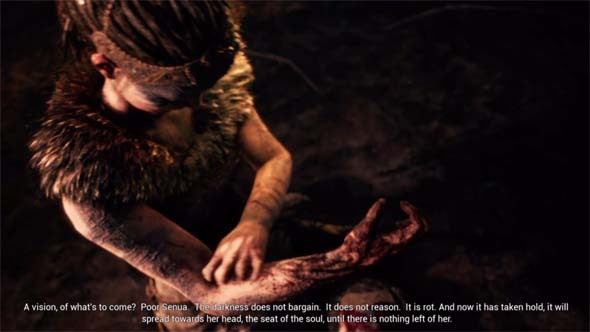 Early in the game, Senua is afflicted by a black rot on her arm. Each time she dies, the rot grows, and if it reaches her head, then she is lost to the abyss. At that point, the game is over, and your save file is deleted. It's similar to the concept of hollowing in Dark Souls, except this time, the game is very upfront and explicit in informing you that it can put a premature end to your adventure. Out damned rot! Out, I say! Each time you die, the rot grows. If it reaches your brain, it's game over, and your save file is deleted. This upfront threat puts significant ludic pressure on the player to take Senua's life seriously and to play cautiously and defensively. Not only do you lose some small amount of progress when you die; you may lose all your progress if you are repeatedly sloppy. Ninja Theory isn't completely cruel though. As I progressed through the game, it became apparent that this mechanic is surprisingly forgiving. And if you want to know just how forgiving I think it is, then you can check out the super-duper-secret spoiler section at the bottom of this review. Early in the game, I started to suspect that the rot does not seem to progress if you die repeatedly to the same enemy or trap, so repeat deaths at the hands of a single particularly challenging encounter will not unfairly end your game. In fact, dying in boss encounters didn't seem to progress the rot at all! The combat difficulty is also set to automatically adjust itself by default. So if the waves of enemies become overwhelming for the player, the game will automatically scale them back. 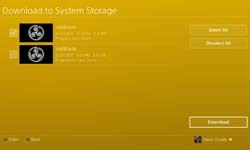 Also, if you happen to be playing on the PS4 (and are a PS Plus member), you can still save scum by using the PS Cloud feature. I would assume that you could also make a copy of your save file for the PC version. So you can use that for insurance if you want. Don't let the threat of perma-death stop you from playing this game. 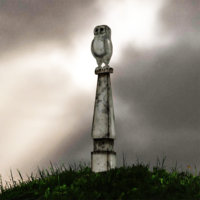 Although not a terrific game, the indie survival adventure game Miasmata (developed by Bob and Joe Johnson of IonFX) is an interesting title that does deserve to be played by its target audience. It's not a particularly challenging game, but players can back themselves up into seemingly insurmountable holes. Knowing the game's mechanics and rules - and knowing them early - is important to ensuring that you aren't forced to restart from the beginning or give up entirely. Like with my previous strategy post for Alien Isolation, I am not going to provide specific walkthroughs for the game or any of its specific set piece challenges. In fact, doing so would be even harder than in Alien because Miasmata is a completely open-ended sandbox game. Instead, I will be offering some general-purpose tips that should be relevant for the entire game. This will include some techniques for working around the game's bugs and odd design flaws. 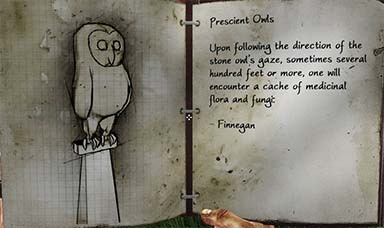 Owl statues point towards a cache of medicinal plants, but they do not count as landmarks or show up on the map.